For years commuters and residents of Northern Virginia have referred to the mess of merging roadways in Springfield as the "mixing bowl." It is easy to see why it got that name. With 50 ramps and 20 lanes, merging of three major interstate highways, I-95, I-495 and I-395 it has gotten a reputation of being both a bottleneck and a confusing interchange. As the huge Springfield Interchange project came to an end and Virginia Department of Transportation (VDOT) turned its attention to "hot lanes" and other projects the 8 years of road construction in Springfield began to fade from commuters minds. However in doing some research on other road projects recently I discovered that the real "mixing bowl" in our area is not and has never been according to VDOT the Springfield Interchange. 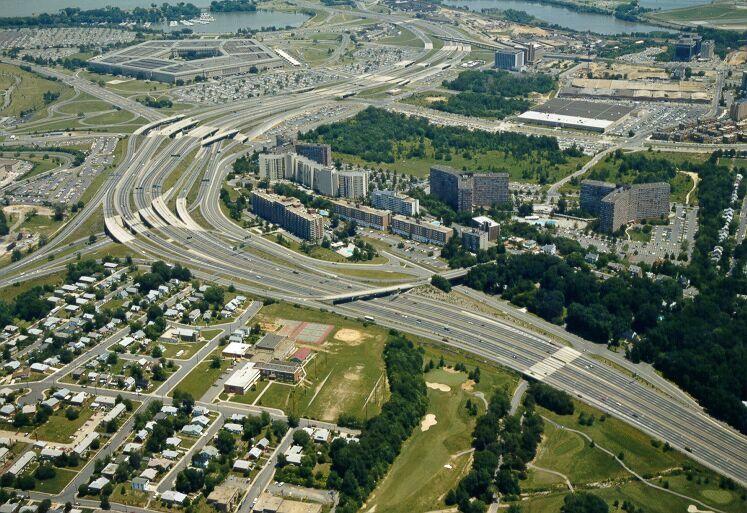 In fact the "mixing bowl" is actually the intersection of roads in Arlington leading to and around the Pentagon. That's right the Pentagon. The first intersection was completed in 1944 were part of what "natives" know as Shirley Highway. The interchange has been rebuilt a couple of times and according to VDOT this interchange has 52 lanes, four highway junctions, reversible HOV lanes and numerous local road intersections all within a 2.5 mile section of the road. Most commuters in the area know that if you make it past the Springfield Interchange with no problems that the next point you are most likely to be stuck in rush hour traffic is around the Pentagon. If you didn't know why before perhaps this little "history" lesson of Northern Virginia roadways will help you understand why. The next time you hear one of the local traffic announcers say there is a traffic jam at the Springfield Mixing Bowl you will know they haven't read my blog! Well, that's a piece of trivia I didn't know. I've been through the Springfield Interchange many a time and it really seems like a mixing bowl to me. You need nerves of steel and the ability to look at and analyze six things at once going through that, er, piece of engineering genius. Cindy, I find a lot of the roads in Northern Virginia to be downright scary! Back in 1980 when looking for housing in Northern Virginia before actually moving there, I would hear the traffic reports on the radio in the morning. There was constant talk about the problems on Shirley Hwy. I did not know where it was but I told my REALTOR not to take me looking anywhere new there. Hopefully it is better now. Ken-I grew up and learned to drive at the Springfield Interchange. I had no problem with crossing six lanes of traffic at 50 miles and hour to get from I-95 to I-495. Yet apparently others did and billions of dollars later you don't have to. Where is the fun in that? Pat-when we were watching parts of the interchange being built we wondered what would happen when the first ice strom hit and there were trucks trying to "fly over" on the I-95 ramp. And sure enough the first ice strom and a truck slid and blocked the ramp. DUH heated ramps anyone? Kate-well it depends on your idea of "better." You will still crawl through Springfield despite the billions of dollars spent and there are still plenty of people who are lost when they try to figure out which direction to go when they get to one of those 50 ramps.